We arrived by car and we got acquainted with our hosts and their farm. The hostess Sanna Puonti told us about her ventures and showed us her farm animals. Besides Welsh and Finnish horses, also goats and adorable small yearlings. 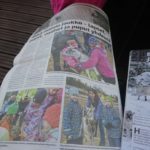 Sanna told us about the Green Care Programme in Finland and one of it’s sub-actions – working with animals. There are different actions with horses at her farm – not actually horseback riding, but communication with the animals, using body language and different ohter stable activities. This direction in animal therapy is being used with disabled people, but also in dealing with other problems, for example anxiety and depression. Hiking with goats also deserves to be mentioned. I had read about it from their home page and it seemed quite interesting. We got to try it too. We took from four to five goats by their leashes and went for a walk into the woods. There we released some of them, so they could run and jump here and there. There are a lot of boulders in Finland, so goats love this kind of climbing. It was a lot of fun to sit and watch goats in action. This is the programme they offer to the disabled people. 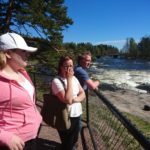 In the evening we took a walk into the centre of Hamina. After that we had a barbecue supper with our hosts, there were interesting flavour impressions from Finnish cookery – our host’s uncle is a hunter, so we tasted wild animals meat. And of course Finnish sauna. Sanna Puonti and I prepared horses for the Centered Riding Demo Lesson. 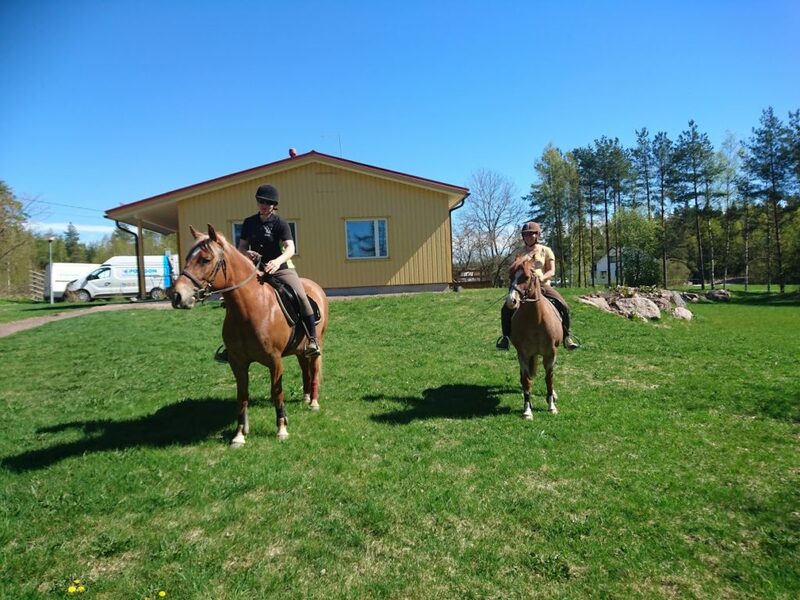 Centered Riding is a very popular special direction of riding in Finland, where person`s body cognizance and cooperation with horse are being improved. I rode a Finnish horse called Heinä and we also took a terrain ride. 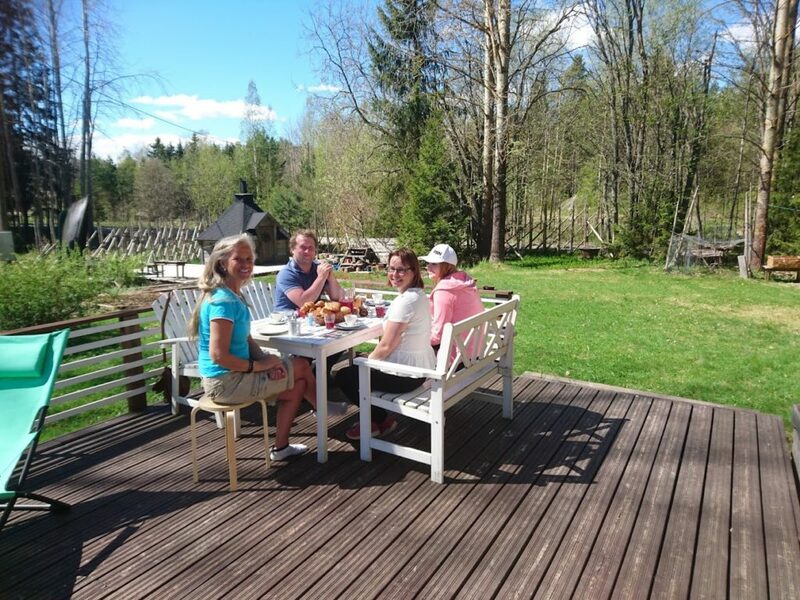 After lunch we visited the Guest House Majatalo Torppa and hostess Pauliina Lunna greeted us there The place was very lovely, besides private summerhouse there were also simple granaries (just like we have for summer use) and rooms and a kitchen at the main house, which all guests can also use. Everything was very cosy. We talked about Estonian and Finnish cooperation, if and how we could send tourists to each other. Both of us felt that it is necessary to introduce smaller places, because people are getting tired of big places they have already visited probably more than once (like Old Town in Tallinn, manors or big strongholds – people are looking for something special, or local). More of that could be provided to Finnish people, also to give Estonian tourists recommendations about places to visit in Finland. We all thought that a liner between Kotka and Kunda would be sensible, we are so close to each other, straight over the sea. 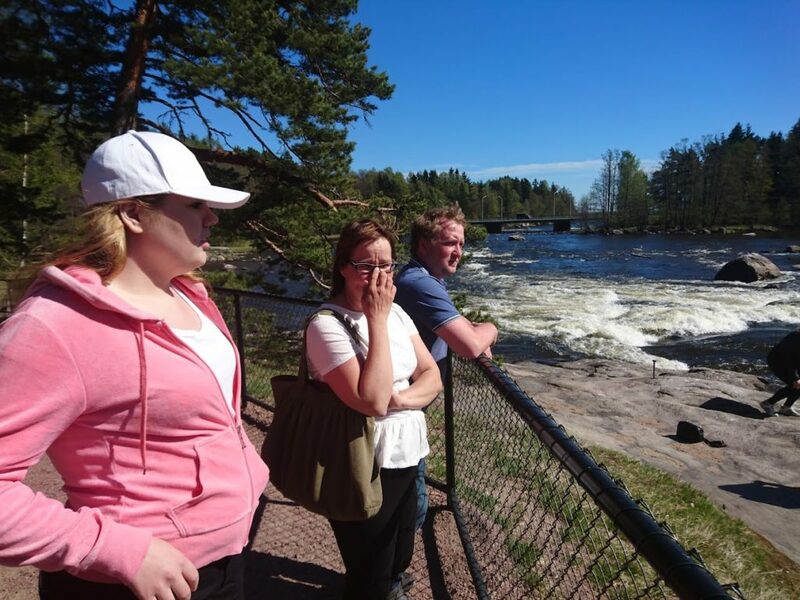 We visited Langinkoski Imperial Fishing Lodge, there were renovated buildings and a visiting centre with a cafeteria by the beautiful riverside where Russian Emperor Alexander III used to go fishing: a peaceful place with beautiful nature and nice hiking trails. We got acquainted with the People School of Jamilahde, especially with the part ment for young people with autism. This school is a stepping stone for children after graduating school and before starting their independent life. They are taught all necessary skills for life and all specialists are available if needed. The school situates inside a beautiful wooden manor by the lake. The school is also a cooperation partner to the Hyvinvoivan Hevosen Stable at Green Care work. Small groups of children go to the stable, work is systematic, the network management is also good. All results are being discussed and new goals set. Finland has the similar system to us, disabled children go to ordinary school. But it is difficult for them to start their independent life, for that they need a stepping stone like this. Teachers and some of the children told us how working at the stable has influenced them and what they would like to do in the future. The reception was very pleasant and we found out that our problems and pleasures are alike (about the disabled people) but of course there are better possibilities in Finland. I have experienced that before, how nice it is, when a disabled person is surrounded by a supportive network which cooperates and has the same goals. After lunch we started our way back home. The trip was interesting, filled with many nice meetings and a lot of new thoughts. Our schedule was peaceful, we had time for communication – we could sit, talk and exchange thoughts. We also made small plans about Susanna coming to visit us in Estonia. 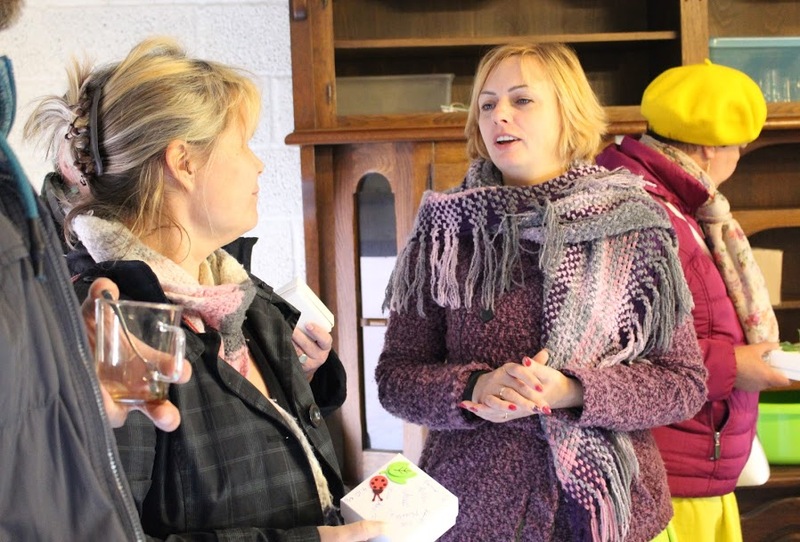 Many thanks to Arenduskoda for this project and of course to Sanna for hosting us and introducing us her ventures!